I ended up at a dinner party this week at Biaggis Ristorante Italiano in Deer Park, Illinois. Chef and managing partner, Tony Marlotti, prepared some wonderful dishes to compliment the wines we tasted. Biaggis Ristorante Italiano is a chain of around twenty gourmet Italian restaurants serving many traditional favorites plus special creations cooked up by the Executive Chef. When you first enter the restaurant the wide open décor is warm and inviting. A large bar area separates the main dining area and a private dining area is separate from everyone else. This is where we had our dinner. When we entered the private dining area a beautiful display table was set up by Biaggi’s beverage team that displayed all of the wines that were being served that evening. The event was hosted by The Shilling & Kramer, who imported the wines from the Piedmont region of Italy and Bacchus Wine Company, who distributes the wines here in Illinois. Again I find myself surrounded by wine experts. Though I’m not a novice. I’ve been in this business long enough to have tasted some pretty great wines. As far as the food was concerned, Chef Marlotti did a great job in creating some very unique dishes to pair with the wines that were being served. We were first served “Insalata con Rucola”, which was a light arugala salad with figs and nuts. A great start to a great evening. The first wine that was served was “De Faveri Colli Trevigiani Spago Prosecco”. This wine was a nice light dry sparkling wine with a little nutty flavor to it and went very well with the “Gamberi al Erbe, Fungi e Patate” , which is herb crusted shrimp with caramelized mushrooms and roasted potatoes served in a shrimp stock. An excellent dish for this wine. Next we tasted a bottle of “Mauro Veglio Barbera d’Alba 2005” which was full and robust in flavor with a bouquet of spices and fruit. This wine was served with “Campanelle con Ceci e Cavolfiore” which is flowered shaped pasta tossed with chickpeas and cauliflower in a zesty sauce. This dish turned out to be one of my favorites and went very well with the choice of wine. The next dish was my absolute favorite. We were served “Pollo e Melanzane Arrabiata” which was a roasted chicken wrapped with eggplant with a sweet spicy tomato sauce. This excellent dish was paired with an excellent bottle of Mauro Veglio Dolceito 2005”. Unfortunately we all agreed at the table the food and the wine was great separately but didn’t pair up that well together. The other entrée was “Agnello Arrostato al Tartufo” which is a roasted lamb that was served with black truffles, cipolin onions and cavolo nero Italian black cabbage with a veal reduction. An excellent choice for the “Mauro Veglio Casteletto Borolo 2001 that we tasted. Though the lamb could have been rarer for my taste, the dish was a great show of creativity. To end the evening we were served “Pesche Ripieni alla Piedmontese” which is stuffed peaches with zabaglione. A light and simple dessert that truly complimented the entire menu. 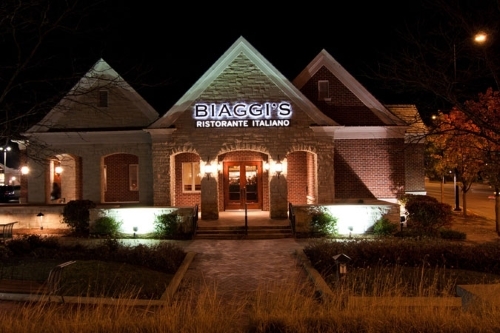 Biaggis Ristorante Italiano is located at 20560 North Rand Road, Deer Park, Illinois 60010. For reservations phone 847-438-1850 or visit their website at www.biaggis.com.